Dubai (AFP) - Saudi Arabia on Friday postponed the next round of flogging for a blogger sentenced to 1,000 lashes for insulting Islam because his wounds from last week's beating have not yet healed, his wife said. The public flogging of Raef Badawi, who is also serving a 10-year jail sentence, has sparked an international outcry and a campaign by Amnesty International and other rights groups to free him. His wife Ensaf Haidar told AFP: "We only knew today that Badawi's case was referred by the royal court to the supreme court nearly a month ago," possibly paving the way for an appeal. Badawi received the first 50 lashes of his sentence outside a mosque in the Red Sea city of Jeddah on January 9. He is expected to undergo a total of 20 flogging sessions until his punishment is complete, but Haidar said the second round of lashes had been postponed on Friday. "The prison doctor saw Badawi's health does not allow his flogging today," she told AFP by telephone from Canada where she has sought asylum with her three children. "The wounds caused by the flogging last time do not allow flogging him this time as well," she said. "But it will probably still take place next Friday." Amnesty said that the doctor had concluded that Badawi "would not be able to withstand another round of lashes at this time". It also said the doctor had recommended the flogging be postponed until next week. "Not only does this postponement... expose the utter brutality of this punishment, it underlines its outrageous inhumanity," said Amnesty's Said Boumedouha. "The notion that Raef Badawi must be allowed to heal so that he can suffer this cruel punishment again and again is macabre and outrageous." 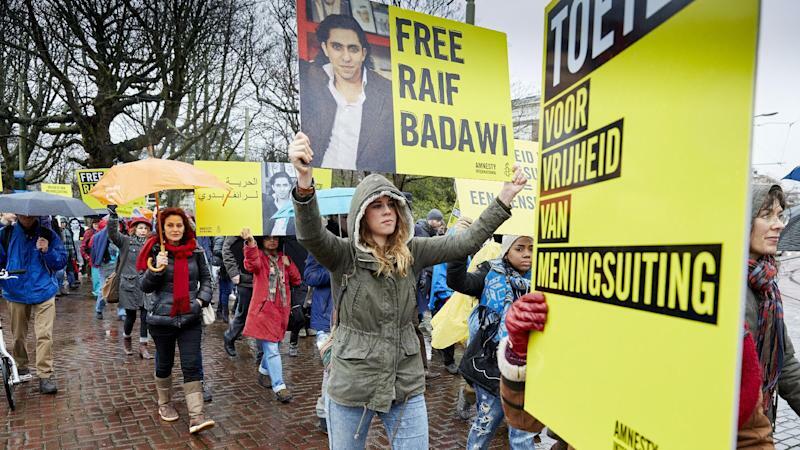 Reporters Without Borders said it was "relieved" that Friday's flogging of Badawi was called off but remained "very concerned about his health and urges the authorities to abandon this barbaric punishment altogether because it could prove fatal." "Saudi Arabia can no longer deny the gravity of this flogging, a barbaric punishment that is contrary to international law,” RSF secretary general Christophe Deloire said. RSF warned that Badawi "would not survive" the flogging, describing it as a "death sentence." In September, a Saudi court upheld the decade-long jail sentence and 1,000 lashes for Badawi, who has been behind bars since June 2012. 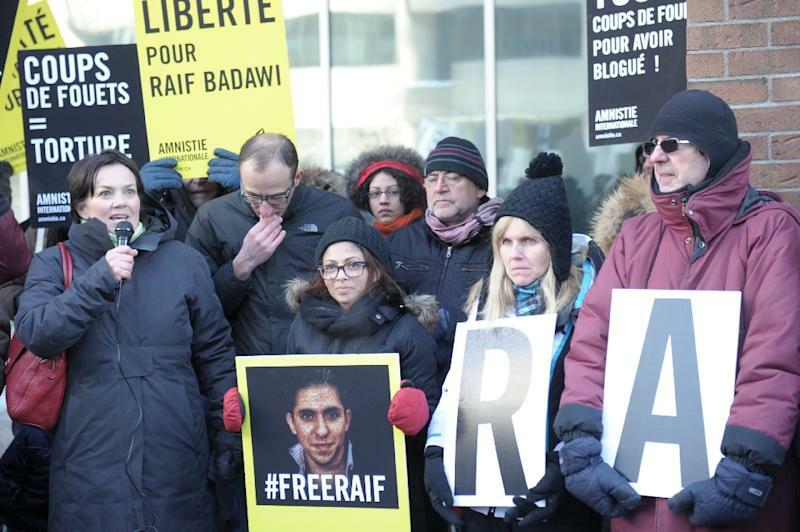 His wife, who lives in Quebec, urged "all the world and all governments to pressure Saudi to free Raef." UN human rights chief Zeid Ra'ad Al Hussein on Thursday urged ailing Saudi King Abdullah to pardon Badawi, saying flogging is "cruel and inhuman" and prohibited under international human rights law. 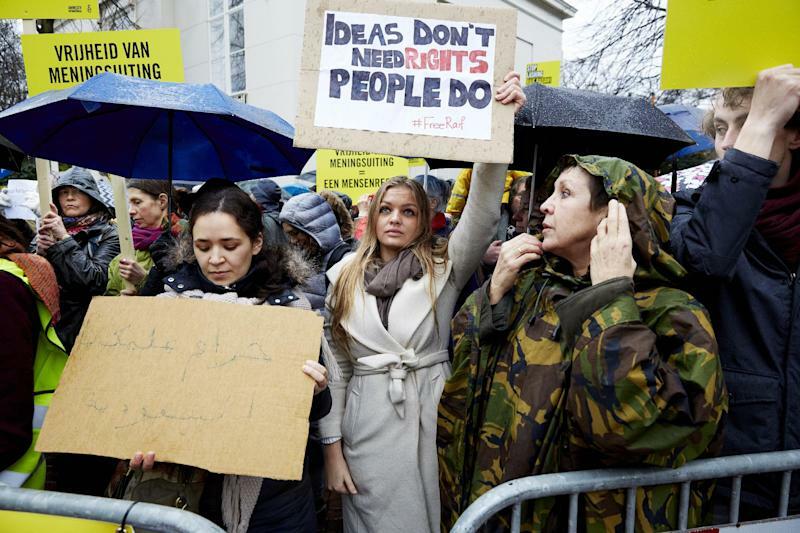 The United States, Sweden, and Reporters Without Borders (RSF) have denounced the flogging as a horrific form of punishment, saying Badawi was exercising his right to freedom of expression. Canada has also condemned the sentence and called for a pardon. Badawi co-founded the now-banned Saudi Liberal Network along with women's rights campaigner Suad al-Shammari, who was also accused of insulting Islam and arrested last October. Shammari has said the charges against Badawi were brought after the Saudi Liberal Network criticised clerics and the kingdom's notorious religious police, who have been accused of a heavy-handed enforcement of sharia Islamic law. Haidar told AFP that Badawi's trial had focused on statements he made to France 24 in December 2010 in which he defended liberal thought and said: "An atheist has the right to say what he wants... and nobody has the right to hold him accountable for his opinion." At the time, Badawi said his online Liberal Network had "angered radicals in Saudi because it exposes their actions and specially those of the Committee for the Promotion of Virtue and the Prevention of Vice," more commonly known as the religious police. He had also said that he was in hiding and had received many threats, including death threats. In July 2013, a court initially sentenced Badawi to more than seven years and 600 lashes, but an appeals court overturned the ruling, sending the case back for a retrial that resulted in a harsher sentence.